Many parents worry when their kids are sick and that is a natural part of parenting, but there are growing number of parents who consider a fever to be something dangerous. Some parents freak out with a fever over 100F or 101F and will resort to chemical medications to bring the fever down quickly. The truth is that a fever in and of itself is not usually something that is dangerous to your child’s health and well-being. In fact, in the vast majority of cases, a fever is a good thing and is a natural part of the body’s defense against germs, viruses, and other invaders. How did a simple fever come to be seen as so dangerous that we risk overdosing on medication in order suppress the temperature in our children? There is an inseparable link between fevers and kids’ health and this leaves many parents wondering what to do with a fever and when they need to start worrying about a fever. First, we need to understand that the two functions of fever are to stimulate the immune system so it starts fighting and to create an environment where the virus and bacteria attacking the body cannot live and multiply. Low fevers are not a bad thing and actually show that the body is fighting the invaders and working to push the sickness out of the body, so the view many parents have about fevers is faulty and is causing them to hinder the body’s natural defense system. Certain compounds are released into the blood during an attack by an outside antigen like a virus, and these compounds work their way up to the hypothalamus which is located in your brain. The hypothalamus is what tells the body that its temperature must be just 98.6 degrees F. It also regulates the hormones throughout the body so they are maintained just at the appropriate levels in the bloodstream. So when the hypothalamus gets the messages from the compounds released by the body as it fights off an infection or some bacteria, it knows that 98.6 degrees F just isn’t enough anymore. The hypothalamus then secretes more hormones into the blood that will trigger a rise in body temperature. Usually the increase is to 100F or 101F to start as that is usually enough to fight off most basic entry level attacks. In regards to fevers and kids’ health, it is common for a child to have a low grade 101F fever when they have a cold or an ear infection. Even higher temperatures for more serve attacks are not necessarily cause for concern in regards to the fever itself. 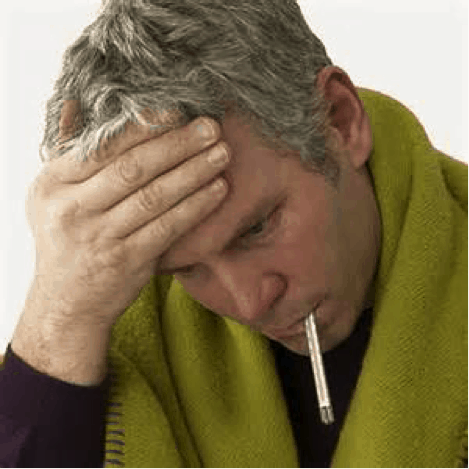 Fevers have to get fairly high for an extended period of time before it is a real cause for concern. The answer to the question of what to do with a fever most often is simple but so hard to do- nothing and just let it run its course. More antibodies: specialized cells that are designed to attack invading antigens are produced at a higher rate during a fever and they are more focused on eradication than any chemical pharmaceutical drug could ever be. More white blood cells: these are the good guys that help to fight off invading bugs and there are more of them produced, circulating, mobilizing and fighting in the bloodstream when the body is being heated with a fever. More interferon: this amazing compound is found in the blood and when activated, such as during a fever, it works to prevent the spread of the antigens and keeps the attacking virus or bacteria isolated and contained to one area so it is easier for the body to fight and destroy it. Limiting access to iron: this is very helpful during some fever bug instances because iron is one of the common elements which bacteria feed on. Higher temperatures kills microbes: microbes grow and multiply best in cooler areas so when you lower a fever too soon you are actually heling the very thing that is making your kids sick! -Infants of only a few months old or less with a temperature over 100.4 degrees F. Seek care immediately for any infant of a few months old who has a fever over 100F. While waiting for care, if the baby is able to it is best to breastfeed as much as they want because natural breastmilk has antibodies that can help boost the immune system almost as soon as it is consumed. -Infants of 3-6 months of age, with a 100.4 degrees F or higher if they appear ill. Fevers of less than 100.5F where the child is acting normal and seems find other than the fever it is ok to wait a few hours and see how they are later on. Again, breastfeed on demand during this time. -Children between 6 and 36 months, with a temperature above 102.2 degrees F, if they appear ill. Even if they are acting fairly normal it can still be a good idea to see medical advice from the pediatrician, especially if they seem to not be eating or drinking as much as they normally do. -Anyone at any age with a temperature over 104.5 degrees F.
-For children not in the above three categories, bed rest and fluids will support the fever and allow it to do the job that your child needs it to do. It is best to hold off the medications as long as possible and find other ways to ease any pain and discomfort the child may be in though it they are really complaining of sore throats, ear aches, and other issues then it may be time to head to the doctor to make sure what the underlying cause of the fever is. May parent find fevers to be terrifying, especially with their first child, but there is a lot they can learn about fevers and kids’ health and what to do with a fever to make the choice as to what is best for their child.